Apple finally released iOS 8.1.3 to the public yesterday and it includes a bunch of bug fixes and performance improvements. The update was supposed to actually be released last week, but the firmware was undergoing more testing. 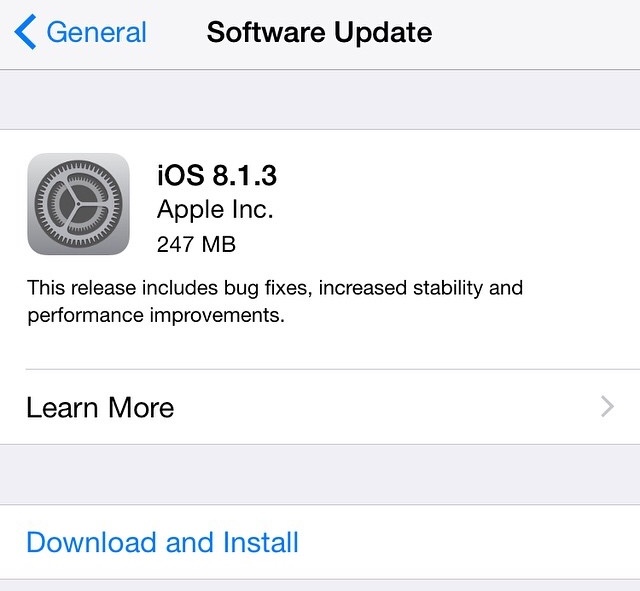 The iOS 8.1.3 update reduces the amount of storage required to perform software updates via OTA. It also fixes a bug that stopped users from entering their Apple ID password for Messages and FaceTime. Several users also faced an issue where the multitasking gestures wouldn’t work on the iPad, which has been fixed in this update. Sometimes Spotlight didn’t display app results, that has been fixed too. You can download this update on your iOS device via Settings>General>Software Update or you could download it via iTunes by connecting your iDevice to the computer. If you want to keep your jailbreak, it is highly recommended that you do not update at this moment. iOS 8.1.3 is compatible on iPhone 4S or later, iPad 2 or later and the iPod Touch 5th gen.